How art can be used as a tool for social awakening. Artistic activism is a way of thinking that generates actions which go beyond what is conventional to human society. It has played a major role in combating slavery, challenging polemic social tactics and politics, protecting human and non-human beings from exploitation, defending the environment, promoting gender equality, opposing speciesism, racism, sexism and so many other significant issues. Every work of art, including documentaries, is a reflective representation of reality. Dominion documentary attributes the harsh reality just as it is, without blinkers and with a strong sense of responsibility towards the viewer. It is a documentary that explores the ethics and validity of our sovereignty over the planet and will be presented for the first time in a Biennale globally. Activists with drones, hidden and handheld cameras have managed to unravel the barbarity of the animal exploitation industries. After the screening, there will be an open dialogue with the viewers about speciesism and its devastating extensions, with Yorgos Tsamis (artist educator, eco-activist) and Tina Petritsopoulou (fashion designer, translator, activist) from the non-profit initiative Ethos & Empathy. ATTENTION! The exact location of the screening is Stadiou 22 (not 15 where the expo takes place), at the screenings’ room (Esperia Place, KINO, 1st floor). 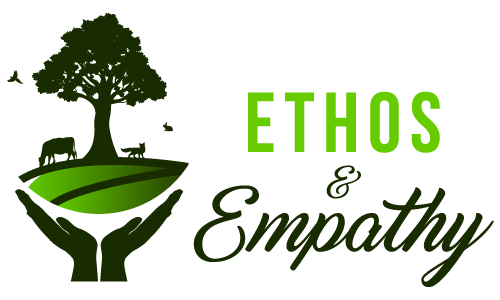 Ethos & Empathy is a not for profit initiative and its mission is to promote in Greece antispeciesism and ecology (more specifically the Zero Waste lifestyle).